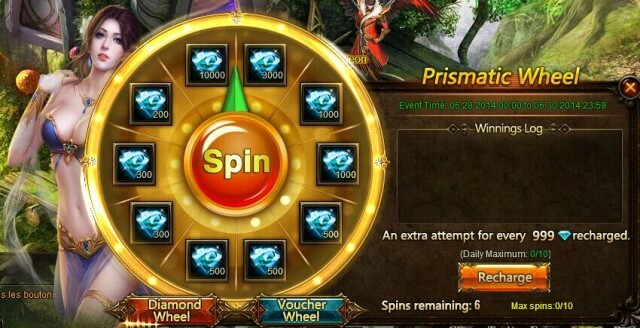 LoA_New Prismatic Wheel! Win up to 10000 Diamonds! Chance to win up to 10000 Diamonds! At most to win 10 times Diamonds! -Click on the “Prismatic Wheel” on the left of the game screen to open the event menu. -There are 2 types of Wheels: Diamond Wheel & Voucher Wheel. Each can get diamonds and vouchers. 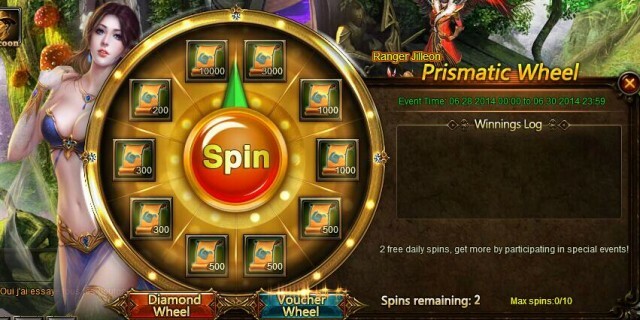 Diamonds Wheel: Recharge 999 diamonds to get one chance to spin, you can spin 10 times at most everyday. Description: Recharge certain amount of Diamonds and collect required Gems to exchange the Fusion Gem Chest! Description: chance to exchange the unwanted Fusion Gems into the desirable ones.